Our local Transition initiative in Los Angeles hosted a vigil this past weekend as part of the worldwide actions organized by 350.org These actions were coordinated to take place during the weekend midway through the Copenhagen climate talks. As a 350 organizer, I have been watching the news services and the 350.org site for mention of progress. The photos from the weekend were breathtakingly beautiful. I cannot watch the video without breaking into tears. There were more than 3,200 events in local communities around the world. In Copenhagen itself, more than 100,000 people marching in the streets--99% of them peaceful and dignified (although the conventional media finds a way to capture the sensationalist message they want to deliver). "We marched in Berlin and the wall fell. We marched in South Africa and apartheid fell. 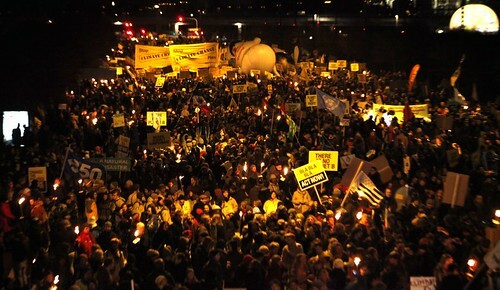 We marched in Copenhagen ..."
For one weekend, we felt the solidarity. We were Tuvalu's army, 11 million strong, fighting for that 350 figure. This morning's news was far less enthusiastic. The 350ppm figure which had been in the negotiations all last week has apparently been removed from the negotiating table. As I write this, there is not much information about how or why. As a result, the G77 nations -- mostly smaller, less developed nations, many of whom are on the "front lines" of climate change impacts -- have withdrawn from this afternoon's discussions (Monday 12/14) and developed nations are throwing accusations. One EU representative I saw on live feed this morning was attempting to blame the stalling of the talks on the G77 nations, right after he had stated that developed nations couldn't manage more than a 30% carbon reduction. The U.S. representative didn't even show his face. Who is doing the stalling, please? Through it all, I return to two key articles I read this weekend. One is on the (relatively new) Transition Times out of Colorado. An article by John Michael Greer, about why the top-down political process cannot possibly achieve this massive realignment of societal thinking. Suppose the improbable happened, and both Obama and Congress agreed to implement serious carbon emission cuts. What would the result be? Much more likely than not, a decisive Republican victory in the 2010 congressional elections, followed by the repeal of the laws mandating the cuts. My husband (who could perhaps be called a political philosopher by avocation) says: The leaders will go where the people go. We have to change the minds at a grassroots level and our leadership will follow. The other article which has stuck with me this weekend is by Naresh Giangrande of Totnes, who was in Los Angeles last December to give us our Transition Training. Naresh is at the Copenhagen conferences right now. And again and again, people are telling him, “Go on doing what you are doing. Keep doing Transition.” Keep on creating the changes from the grassroots level. It really is the only thing we have left.